Swing sets are a staple found at schools, parks and in open spaces everywhere. Racing to the swings at recess and leisurely swinging is a fun, timeless past time that builds friendship, agility, posture and upper and lower body strength. Traditionally crafted, the 8â€™ Single Bay Swing set is designed with comfortable strap seats and a highly durable bipod swing frame. Both swing seats attach with 'S' hooks, clevises and welded chains to the top frame rail. The top rail and leg frame is constructed with 2-3/8" galvanized iron piping and features powder-coated 2-7/8" iron pipe yoke fittings. 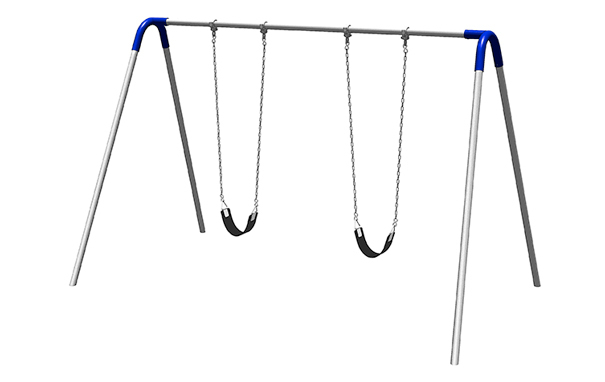 The 8' Single Bay Swing Set is great for schools, parks, community centers and homes.